JUST as the horse has been ousted from the streets by the ubiquitous automobile, so the camel, for centuries known as the “Ship of the Desert,” seems doomed, if the plans of a prominent engineer of Kiel, Germany, are carried into effect. 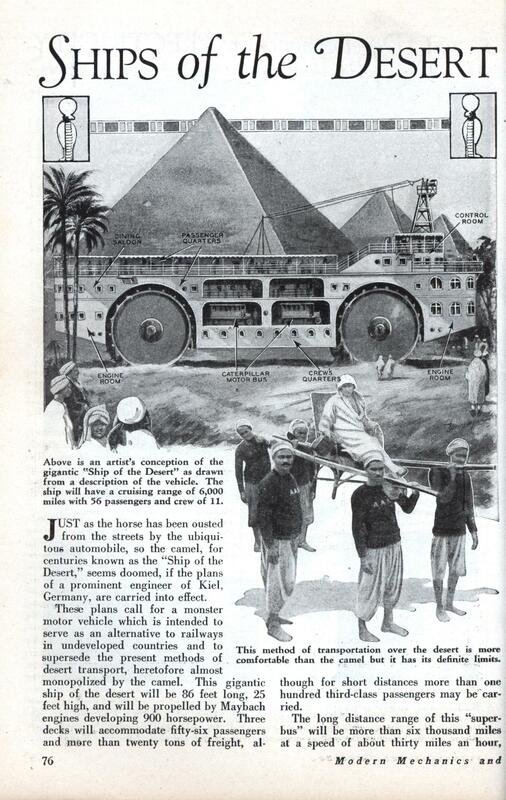 These plans call for a monster motor vehicle which is intended to serve as an alternative to railways in undeveloped countries and to supersede the present methods of desert transport, heretofore almost monopolized by the camel. This gigantic ship of the desert will be 86 feet long, 25 feet high, and will be propelled by Maybach engines developing 900 horsepower. Three decks will accommodate fifty-six passengers and mere than twenty tons of freight, al- though for short distances more than one hundred third-class passengers may be carried. The long distance range of this “super-bus” will be more than six thousand miles at a speed of about thirty miles an hour, although on short distance hauls with heavier loads the speed will probably be about half that. To enable it to traverse the large dunes found on the desert, the entire body of the desert ship will be suspended in a cradle from hydraulic springs on the axles of the wheels, which are to be fifteen feet in diameter. 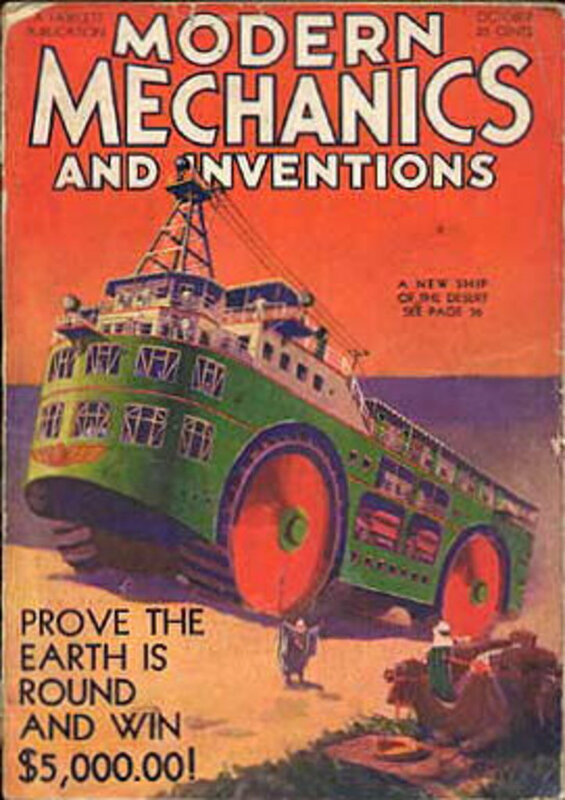 The ship will build its own roads as it traverses the shifting sands of the trackless Sahara, for the enormous weight, in conjunc- tion with the extremely wide tread of the wheels, will give a steam roller effect, packing the sands temporarily and facilitating travel by other methods. Steering will be done by electrically driven hydraulic motor. A 7.5 kilowatt Diesel engine and dynamo will furnish the current for steering, lighting, and all other auxiliary purposes. A powerful sending and receiving set will keep the vehicle in touch with the world, and will receive weather reports much the same as a ship at sea. Officers of the ship will also be skilled navigators, for over many stretches of the Sahara trails are obliterated by the shifting sands almost as fast as they are made. Quarters for the first class passengers will rival those of the finest Pullman cars, and will be artificially cooled to combat the sun’s rays. OK, that would have been wickedly cool to see a ship of the desert cruising across the Sahara! This will be a boon for nomadic used robot salesmen who need to reach their clients’ far-flung moisture farms. Funny they don’t look like Jawas. Oh, cool! I’ve been waiting to see this one. Does 900hp sound a little short to drive something that big at 30mph? Obi-Wan: “I think we better get indoors. The Bedouin are easily startled but they’ll soon be back, and in greater numbers. I didn’t know the Jawas were German! Someone must have thought this to be a terrific design but instead purposed for Antarctic travel a few years later. Was there such a a booming market for crossing the Sahara back then? This thing looks like it could quickly and efficiently bury itself in the loose sand and preserve it’s passengers to be found thousands of years later by archaeologists. If only there was some kind of machine that would let people fly over the desert instead of having to travel over land.